The picture changes dramatically for the $500,000 and up market.Â Here supply has increased strongly and demand while improved, is simply normal.Â This is not a good recipe for sellers in this range. â€œIn total contrast to the low end, the market above $500,000 is wallowing in too much supply. Note that we have almost as many active listings above $500,000 as we have below $250,000. 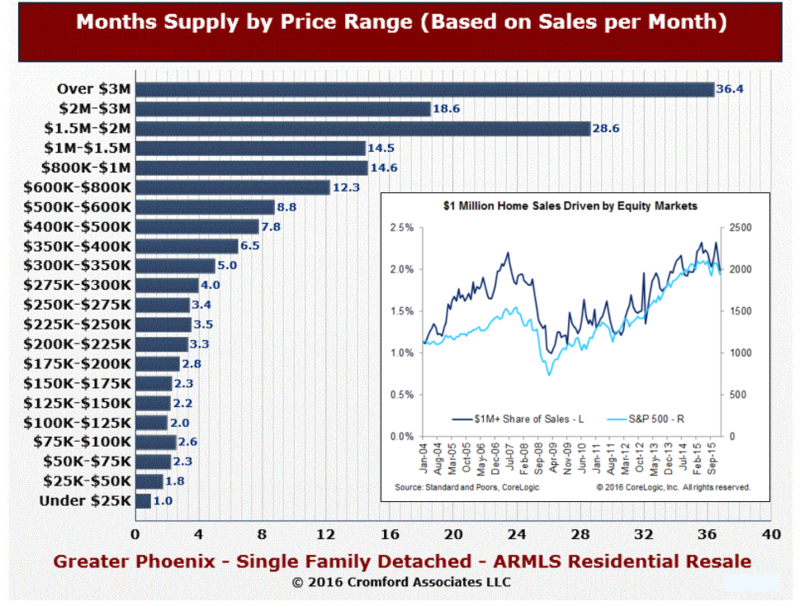 Yet we see almost 7 times as many homes sold below $250,000 than we see over $500,000. Supply was already high last year and has increased by another 15%. The contract writing and closing activity is good and we can conclude that demand is stronger than last year. But despite February sales being up 30% and a strong 21% rise in listings under contract, new listings keep flooding into the market and there is still well over a year of supply. Competing among themselves, most sellers have the weaker hand in negotiations and so pricing is suffering. Based on the monthly average $/SF, the current annual average appreciation rate for homes over $500,000 is a negative 5%. With sales down 10% below $250,000 and up 30% above $500,000, the overall market price statistics are all being skewed much higher. The true pricing environment for the luxury market is far worse than most sellers appreciate. Even for mid range sellers, appreciation is more modest than many of them realize. Only for homes below $250,000 are the overall market’s price appreciation numbers a realistic guide. So no matter what the headlines state or your friends who just sold their home, the experience when buying and selling in 2016 is going to depend on which segment of the market you are participating in.Â A $250,000 seller is going to have a very different experience from the 1.5 million dollar seller.Â No matter the price or area, we can help you decipher â€œyour marketâ€.Â As always, we are here to help.